Who can benefit from Net-Metering? 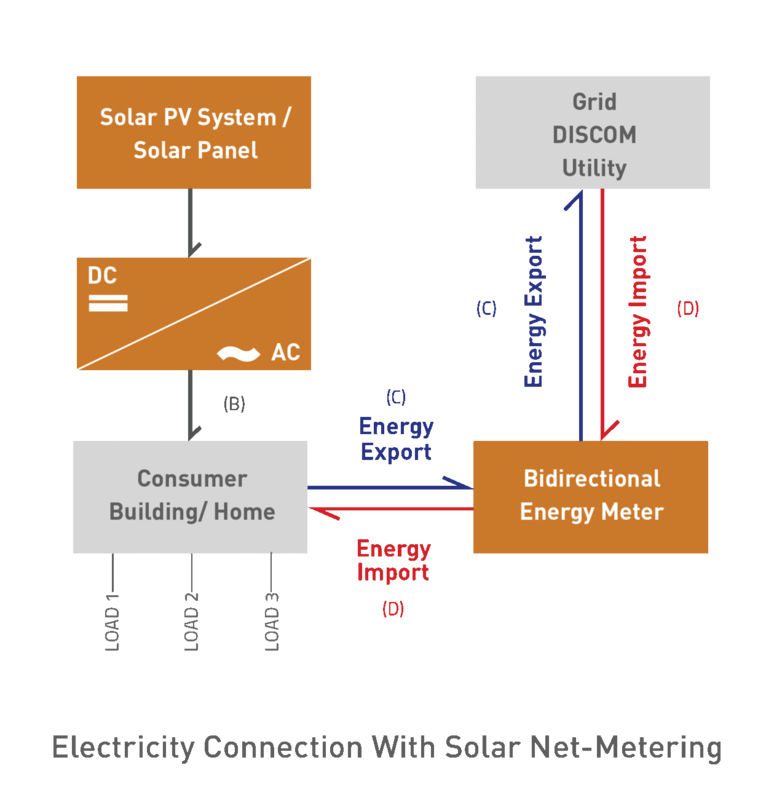 How to apply for Net-Metering? Amongst all the Indian states and UTs, Haryana has stood out for taking a lead in promoting solar throughout the state through various measures. Specifically for the promotion of rooftop solar, the state of Haryana announced a Solar Net-Metering policy in November 2015, under which only grid-connected solar PV systems are eligible. Once the user has opted for Net-Metering, the solar system will generate power everyday for the next 25 years and more. In cases where the consumed energy on certain days in a week or certain months in a year is very low or almost nil, solar net-metering would be really useful. When the consumer’s solar system is generating more solar energy than is being consumed, the excess solar energy is exported to the grid/ DISCOM and giving the consumer the benefit of the solar energy unutilized by him, which without net-metering, he would not have been able to get. Sunlight falling on grid-connected Solar PV systems is converted into DC (Direct Current) output. This DC output is then converted into AC (Alternating Current) output by a solar inverter. This AC output from the solar inverter is further connected to the distribution board or switch-board of the building or the home from where it gets distributed throughout the house for consumption by the electrical appliances that are connected. If at any point in time, the solar energy being produced by the system is more than what the loads in the building or home are consuming, the surplus solar energy is automatically exported (energy export) to the DISCOM’s distribution network (the grid). This exchange is monitored by a two-way meter. If however, the solar energy being generated is less than the total energy required in the building, then the shortfall energy is automatically imported from the grid (energy import). Therefore, the consumer at all times will have adequate power. The existing energy meter in your building or home will need to be replaced by a two-way (bidirectional) meter. This activity would be undertaken by a representative of your DISCOM. 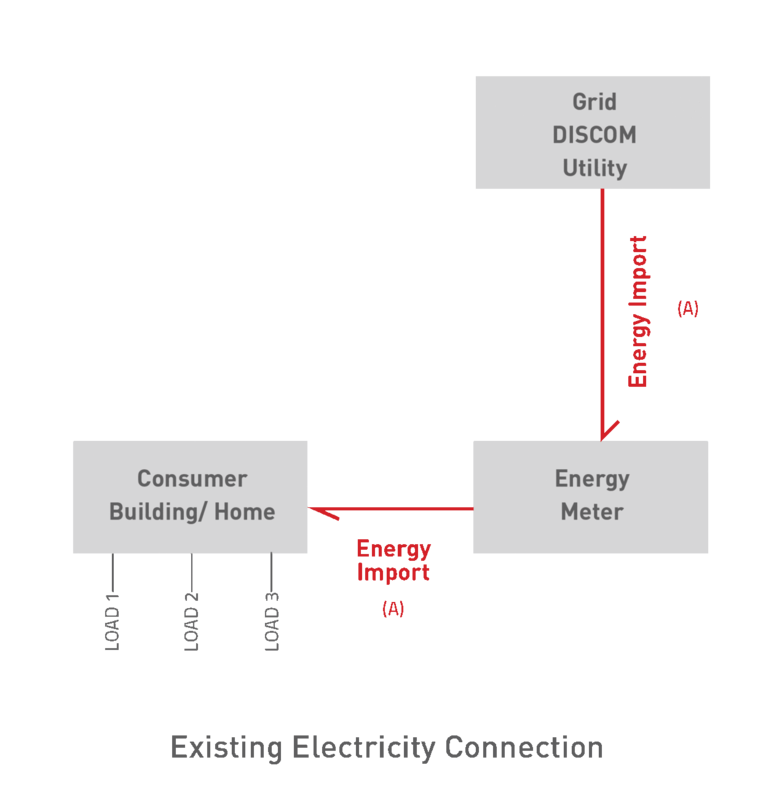 This bidirectional energy meter is essential as it can measure both, energy import (from the grid to the consumer) and energy export (from the consumer to the grid) separately, ensuring that you always get the full benefit of the excess solar energy that you have supplied back to the grid. You will see bidirectional meters also referred to as import-export energy meters. Consumers that opt for solar net-metering in Haryana will only pay for the difference in energy imported and the energy exported. However, at the end of the settlement period, the solar energy will be capped at 90% of the electricity imported during the period. Illustration: If a consumer in Faridabad, located in Haryana imports 1000 kWh in June billing period and exports 600 kWh in the same period, the consumer will be charged for only 400kWh. If the import energy in the July period is 500 kWh and the export again is 600kWh, then the excess 100kWh will be carried over to the next month’s bill or next billing cycle and adjusted there. At the end of the Settlement period (a 12 month period in case of Haryana), the total energy consumed throughout the tariff period will be calculated, basis which the benefit of the solar energy export shall be determined. For any solar generation over and above the solar energy cap, no benefits will be given by the DISCOM to the consumer. As the net import > export, the net billable units = 149 (1,167 - 237 - 781) leading to a reduced monthly energy bill of Rs. 897, which is a saving of Rs. 9,103 per month. Had export been greater than the import, the consumer would have got the benefit for solar energy equivalent to 90% of the electricity imported throughout the settlement period. The consumer will not get the benefit for the additional solar energy generated. The benefits of the Haryana solar net-metering policy can be availed by individual, residential energy consumers and by industries, commercial establishments and government owned buildings whether you are in Gurgaon, Manesar, Rewari, Faridabad, Karnal, Panipat, Rohtak or any other city/ town in Haryana (HR). Also, Haryana state utility companies like Uttar Haryana Bijli Vitran Nigam (UHBVN) and Dakshin Haryana Bijli Vitran Nigam (DHBVN) are all to support and implement net-metering in the state. The eligible consumer shall make an application to the DISCOM alongwith the application fees, seeking permission for installing a rooftop solar system in his premises. DISCOM shall complete the process of verification within 15 (fifteen) days and grant permission if the system installation is found to be technically feasible. Once approval is granted, net-metering agreement will be signed between the consumer and the DISCOM. What are the Fees involved in application for Net-Metering in Haryana?